Former White House chief strategist Steve Bannon has reportedly considered running for president in 2020 if Donald Trump doesn’t. Bannon apparently pegs Trump’s chances of serving the remainder of his term at just 30%. 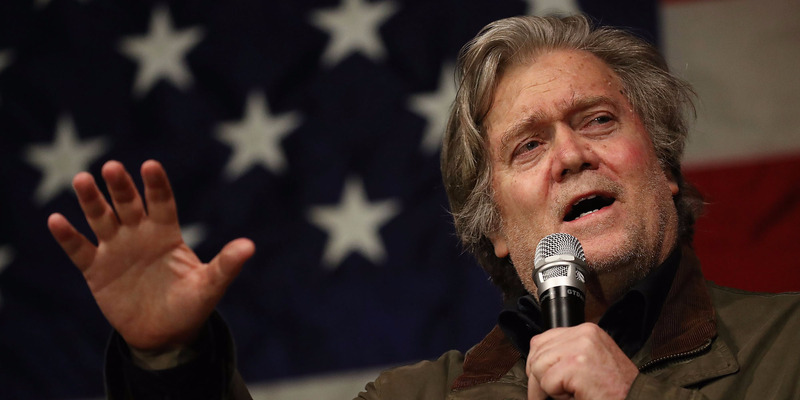 Trump and Bannon have sometimes been at odds, but Bannon continues to publicly support the president and actively promotes their shared “America First” worldview. Steve Bannon, the head of Breitbart News and former White House chief strategist, has considered running for president in 2020, Vanity Fair reported on Thursday – but only if President Donald Trump doesn’t run for reelection. Although the suggestion is little more than a passing thought at this point, Bannon may seriously consider it if things go downhill for Trump. He reportedly believes Trump could be impeached by Congress or removed by the Cabinet invoking the 25th amendment before the end of his first term. Bannon has previously told people in private conversations that he believes Trump has a 30% chance of making it all the way through his four years. Although Bannon left the White House following reports in August that he had clashed with other administration officials, he remains in touch with the president. He’s had eight phone calls with Trump since he left his role as chief strategist, according to the Vanity Fair report. Yet Trump and Bannon haven’t always seen eye-to-eye. While Trump initially backed Republican Senate candidate Luther Strange during the GOP primary for the US Senate seat in Alabama, Bannon campaigned for Roy Moore, who ended up losing to Democrat Doug Jones. Trump ultimately endorsed Moore in the final weeks of the race. In another example, after Bannon participated in Josh Green’s book “Devil’s Bargain,” which painted Trump and Bannon as equally responsible for Trump’s election win, the president was clearly defensive. Despite their at times push-and-pull relationship, Bannon and Trump appear to remain friends. Bannon’s Breitbart still regularly praises Trump and calls out his detractors. Bannon has also promised to go to war against what he calls the “establishment globalist clique on Capitol Hill” during the 2018 midterms in an effort to promote GOP leaders loyal to Trump’s populist, nationalist base.